From tissue dispenser napkins, that can help you to manage wastage and cost through a controlled system, to linen style table covers, that create a fine dining experience without the inconvenience of hiring linen, we are sure to have the right tableware solution for your business. 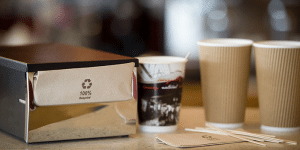 Printed tableware is a cost-effective marketing tool used by food operators to promote their business brand and help them ‘standout from the crowd’ in a competitive high street environment. Our dedicated print management team works closely with leading suppliers to design, create and manage bespoke printed tableware for customers, holding stock for up to 6-months to ensure continuity of supply. The trend for seasonally themed tableware continues to grow as food operators increasingly adapt menus throughout the year, to celebrate popular events with festive foods, or to reflect the season with in-season produce.Our extensive range of tableware and bespoke print service, alongside our annual Christmas and New Year collection of crackers and tableware, ensures that our customers can choose from a range of tableware to suit all seasons, events or festive menus. Why choose disposable napkins over linen napkins? Disposable napkins provide fantastic benefits over linen, particularly as they do not require washing for re-use. 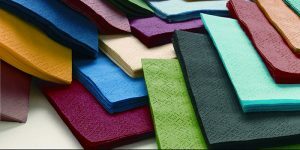 Key benefits of disposable napkins include improved stock control, no holes, consistency of colour, and square corners every time. Perfect for on-the-go dishes, disposable napkins can be taken away, used and disposed of after use. 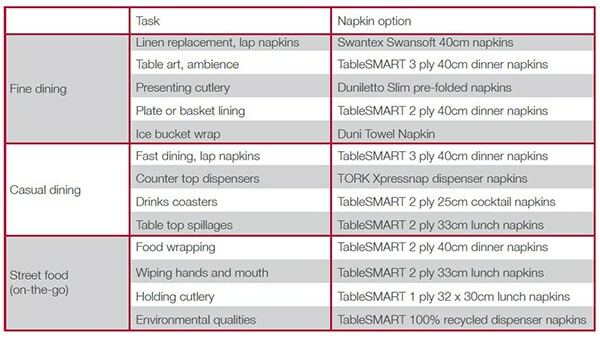 When choosing the right napkins for your catering operation its important to think about what tasks the napkins will be required to complete. To help you identify some suitable napkin choices by task, we’ve created a simple guide below. Most of these napkins can be custom printed with your own business logo or branding. 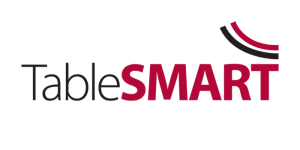 Whether you’re operating in a quick service environment or managing a formal dining area, TableSMART tableware offers a choice of napkins, table covers and candles that will exceed your demands. 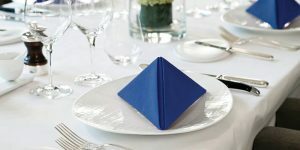 The TableSMART range includes tissue dispenser napkins, 1 ply, 2 ply and 3 ply napkins in a variety of sizes and colours, airlaid napkins, banquet rolls and slipcovers and a 100 per cent recycled printed napkin is available for businesses working to reduce their environmental impact. Located in Kent, Swan Mill are the UK’s largest manufacturer of disposable napkins, offering paper tableware, Christmas products, and catering accessories to suit all occasions and budgets. Family owned and run since 1892, our know-how and experience means the Swantex brand stands for quality, consistency, service and value for money. Our range includes everyday tissue napkins in a breadth of colours and sizes, as well as our premium ‘linen replacement’ brand Swansoft. We also offer paper, wipeable (Swansilk) and premium (Swansoft) table covers to match and contrast. 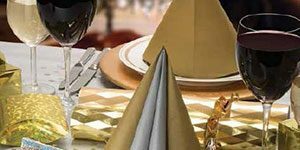 In addition to all of this we also provide a comprehensive design led Christmas solution, including co-ordinated crackers, napkins, tablecoverings and party accessories. To help our customers prepare for the festive season early we have launched our 2018 Christmas & New Year brochure, which is available in a printed or e-brochure format.